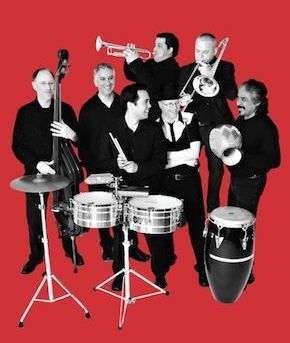 Rumba Calzada's countless tours, festivals and sold out shows across Canada, the US, Malaysia and Philippines has set the standard for excellence for authentic Latin Jazz and Salsa music. Originally formed in 1991 by Boying Geronimo and now headed by his son, Raphael Geronimo, the band has recorded four albums with an array of nominations, including a Juno Award (World Music Album of the Year), Westcoast Music Awards (Outstanding World Recording of the Year) and Independent Music Awards (Best Global Album). With airplay and media praise around the globe, including Montreal, Miami, New York, LA, Columbia, Venezuela, Peru, Malaysia and Manila, Rumba Calzada is gearing up for more shows and recordings, with an all-new album planned for 2019. Raphael Geronimo has been an integral part of the Vancouver Latin and Jazz scene for more than ten years, performing, teaching, writing and directing for many of the city’s best-loved groups. Third generation in a family of professional musicians and dancers, he committed himself at age seventeen to serious musical studies under the direction of his father Boying Geronimo, and made his professional debut one year later. Continuing his training he studied in Cuba at the Laboratorio Internacional de Folklore en la Habana and in New York City at the Harbour Center of Performing Arts. Raphael continues to direct the band Rumba Calzada, which has been nominated for a 2003 Juno Award, 2002 Westcoast Music Award and a 2002 Canadian Independent Music Award. Some highlights of his career include performances with the Edmonton Symphony Orchestra, Winnipeg Philharmonic, Windsor Symphony, Montreal Jazz Festival with Oscar Lopez, and Vancouver International Jazz Festival with Rumba Calzada. Raphael has performed with award winner Poncho Sanchez, Sal Cracchiolo and the Juno nominee Chris Tarry Collective. Other groups he has performed and recorded with include Crash, Alma Libre, Meta 4 Collective, Vince Mai, Gay Delorem, Millennium Project and Soul Stream. Raphael has become known for a vibrant and original sound, which energizes any group he is associated with. Lou received a scholarship at the Banff School for the Arts where he studied with Don Thompson, Dave Holland, Kenny Wheeler and John Abercombie. He continued education in Latin Jazz and Cuban music in Cuba studying with Emilio Morales from the group NG LaBanda, percussionist Anga Diaz from the group Irakere and tres player Papi from Orquesta Reve.. Lou now performs and arranges music for Westcoast nominees World Music groups such as Shango Ashe, The Hard Rubber Orchestra and Rumba Calzada. Lou has performed and recorded with Grammy award winner Poncho Sanchez, Los Munequitos de Cuba, Grupo Jazz Tumbao and Juno nominee Karin Plato. Born in El Salvador Rolo began his career at the age of 12 as a Latin American Folk Ballet Dancer. His career began as a musician in Mexico where he performed with groups such as Nequepio, Guazapa and Yolocamba I’ta. With these groups he has toured throughout Latin America, Mexico, Europe, The United States, and Canada. His career has also extended into television and the movie industry. He has contributed to the creation of the soundtracks to the movies “ SALVADOR” by Oliver Stone and “ROMERO” by John Duighan. Nick is known throughout Vancouver as “the” multi- instrumentalist. He specializes in the Vibraphone and Marimba. He has achieved a Bachelor of Music Degree at the University of Victoria studying with Sal Fererras. Nick was the percussionist for the last two Vancouver Playhouse Productions, “Guys and Dolls” and “The Music Man”. Aside from performing with Rumba Calzada Nick also plays with the high-action, Ashe Brazil. Since coming to Vancouver in 1995, young Trombonist, Rod Murray has become a player in demand for both Jazz and Latin music. He performs with bands such as the Jill Townsend Big Band, The Now Orchestra and the Hard Rubber Orchestra .Rod has appeared on recordings by YES, Collin James, Fred Stride and Hugh Fraser’s – Veggie. 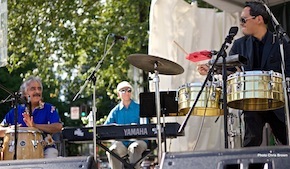 Al has played with most of Vancouver's finest Latin and jazz groups. He has played or recorded with Orquesta La Clave, Grammy winner Lalo Rodriguez (with La Clave), NY Salsa legend and Fania All-Star Larry Harlow (with Seattle's Nueva Era), Ernán López-Nussa, winner of the 2002 Cubadisco Award (Cuba's Grammy) for Latin Jazz (with Orquesta Goma Dura), Rumba Calzada, Alma Libre, Shangó Ashé, and many others. He has travelled extensively throughout the Latin world developing his style, including Cuba, Puerto Rico, and New York. As a trumpeter, Vince has been well entrenched in the West Coast studio/jazz scene for many years with numerous commercial, film and album credits. For years his trumpet solos have been heard on many TV series including Da Vinci’s Inquest, The Chris Isaak Show, McGyver, Lonesome Dove, Scene of the Crime and numerous feature films. As a jazz artist Vince has had the privilege of sharing the stage with top artists in Canada, the United States and Europe. His impressive line up of work credentials is punctuated by performances/recordings with Chuck Israels, Bobby Shew, Natalie Cole, Don Thompson, Eddie Daniels, Ernan Lopez Nussa, Danilo Perez, Robben Ford and Daniel Binelli.